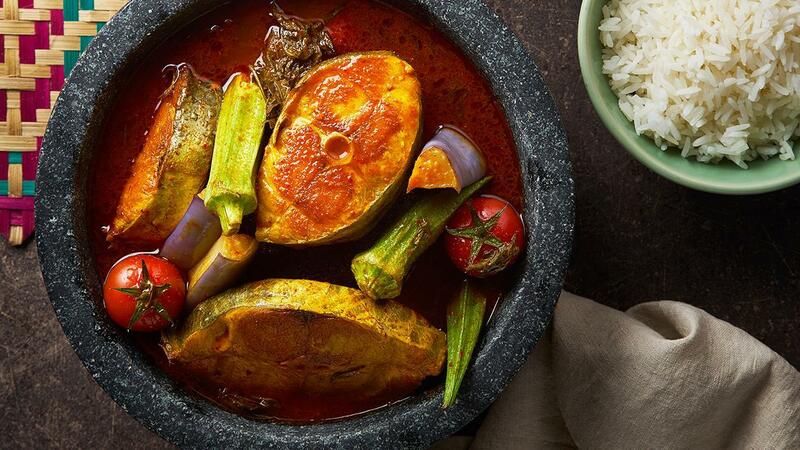 Your diners will love the flavours of Thailand with this Hot and Sour Fish Stew recipe. Perfect as a starter or a light meal, this stew is sure to bring your diners’ taste buds to life, with an explosion of spices and textures in every spoonful. In a pot, boil water and add laksa leaves, dried chilli paste, tom yam paste, asam gelugor, and belachan powder. Bring to a boil. Marinate fish with turmeric, chilli powder, and salt. Then, pan-fry the fish till slightly golden brown. Set aside. Deep-fry okras and brinjals till cooked. Set aside. Add the fish to the pot of stock, and cook for another 5 minutes. Off the heat. To prepare the salad pickle, add cucumber, onion, pineapple, and cherry tomato into a mixing bowl. Add in lemon juice, sugar, and vinegar. Toss till well-incorporated. Portion the rice with asam fish and salad pickle on the side. Garnish with fried okra and brinjal.